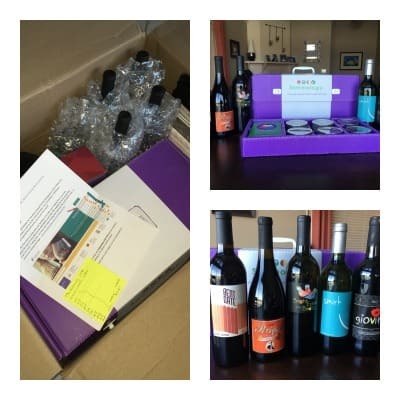 This month I had the opportunity to review the Traveling Vineyard and their Success Kit for new Wine Guides. I’ve always thought the Traveling Vineyard had a fun and unique concept, but also ideal. After all, what's always served at home shopping parties … you guessed it, wine! And who doesn’t love drinking free wine?! The company started back in 2001 with the goal of making wine tastings less stuffy. Well, their relaxed vision took off, and today the company has over 1,000 Wine Guides in over 40 states. The Traveling Vineyard has 21 different varieties of wine in 3 different categories: red, white, and sweet and fizzy. Besides wine, they also sell accessories such as chillers, decanters, and openers. Wines are priced from $14 – $25 per bottle and because it's a consumable item people always need more. Best of all their wines have a guest satisfaction rating of over 98%. In January you can become a Wine Guide for $174 ($99 for the Success Kit and $75 for your first two tasting sets). You can also earn an electric wine opener when you reach $750 in sales within your first 60 days. If you sell $1,400 within your first 60 days, you'll also get a $50 rebate. Lastly, for every friend that you sign up as a Wine Guide during your first 60 days, you'll also receive a $100 bonus when you both reach $750 in sales. The Success Kit comes with everything you need to get started, from wine glasses and decanters to openers, carrying bags, brochures, order forms, marketing materials, educational cards, and your first two wine kits — so that you can host two tasting parties. I was impressed with sommology cards which teach you about all the different varietals, pairings, and aspects of wine. These not only make it super easy to learn about the wine industry, but they're perfect for your customers to view at tasting parties. With the Success Kit, you also get your own Personal Estate Website free for the first three months. Afterward, it’s $15.95 a month. While I didn’t have an opportunity to review the Personal Estate Website, it does contain additional training, videos, and your own personal accounting software, so that you can track orders and see how much money you’re making. For each party that you schedule — you’ll need to bring five bottles of wine for tasting. But the cool thing is if you sell $150 and have at least three orders at your tasting party, you’ll get a $75 credit which you can apply towards your next tasting set. Wine Guides can make 15% – 35% in commission, based on monthly sales volume. Payments are made three times a month via direct deposit. As a Wine Guide, you get a 20% discount off of wine, and these sales are combined in your monthly personal volume. On average, Wine Guides sell $417 per tasting party. And there are no monthly sales quotas, which a lot of direct sales companies do have. Lastly, you can earn incentive trips where you can get an all expense paid trip for meeting certain milestones, like hosting events, sponsoring new team members, and getting promoted. Traveling Vineyard is more like a family than a company. When I first joined this company, I had no idea what I was gaining beyond a job. I knew it would be a great business opportunity, but I had not a clue the incredible friendships and network of personal support I would gain. We are a small, close-knit group of people that mean more to each other than just being co-workers. We support each other within the business and throughout life's ups and downs beyond the business, and that is something I think is very rare. I originally joined the Traveling Vineyard, because I wanted to break into the wine industry, but I had no professional experience other than my deep love for wine. I loved the idea of being able to make my own hours and schedule, and especially being able to dictate my own salary. I truly have the power to control the destiny of my career, including my income, my promotions, and status within the company, as well as my schedule. I was able to take a passion and a hobby and turn it into a career. I have been with the company since April 1, 2014. I had hoped that by the end of 2014 I would have been successful enough with the Traveling Vineyard to be able to quit my full-time job as a fitness professional. By the end of October, I was able to do just that and am proud to say the Traveling Vineyard is my full-time job. I am a full-time wine guide by choice, and I couldn't be happier! I got a call from a friend that wanted me to host a wine tasting at my house so that she could write her trip off to our area. As a business owner, we get to write off anything we do that involves our business, including our initial investment which we earn back in 60 days. Anyway, I said sure, but what is the Traveling Vineyard? She said it is super easy. She would bring me five bottles of wine for free, and all I had to do was invite my wine loving/family and friends. Amazing how many people I know that wanted to come! I thought, “What an amazing and unusual thing to do!” I am always looking to make extra money, so when I found out it was only $200 to get in the business and there were NO other wine guides in my area and only 1,200 in all of the US I knew this would be a great opportunity. I joined August 2013 and started hosting my own tastings and had about 4 with my own people and then it just grew from there! Everyone wanted to host, and I had several girls that wanted to be part of my team. I never feel like I am working when I go to homes for the tastings. Everyone is already excited to drink wine. I pretty much talk about the company and get paid to drink wine with them! It's a win-win for me. I decide how many tastings I want to do or if I want to take the week off. If you have been in direct sales you know building a team helps because we all work together. This really grew quickly for me, and I think that is because it is different from the everyday makeup, candles, jewelry, and bags that are out there. I earned a trip to Aruba with all expenses paid with about 50 other Wine Guides just for having fun and helping the other girls on my team. I do love to help other people meet their goals; I feel like I am giving back. I met the owner and his wife at the convention this past summer and found them to be friendly, fun, and very supportive of all of us. I feel at home with this company! Whether you are looking to make a few extra dollars a month or big money the opportunity is definitely here! 1) Americans love their wine! According to the Wine Institute in 2013 Americans consumed 892 million gallons of wine! So it's a good niche to be involved with. 2) Easy to make money. Wine is a consumable product, so it's easy to get reorders. They have a wide selection of wines, so there's something that will appeal to every taste. I also like the wine club option — this automates your sales, which makes your job easier and more lucrative. With this opportunity, you really can work as little or as much as you'd like, because there are no monthly sales quotas. Not only is this an inexpensive business to start, but you can also earn credits for your tasting sets, so you're not constantly spending money on supplies. The Traveling Vineyard is a member of the Direct Selling Association — which means they are committed to ethical business practices. If you’d like to find out more about the Traveling Vineyard, see their website or sign up for additional information here. This post was sponsored by the Traveling Vineyard. Please be aware that we can only promote advertising from companies that we feel we can legitimately recommend to our readers. For more information, please see our disclosure policy. Thanks so much for your interest. We have 93 total Wine Guides in the state of NY – approximately 20-30 located centrally. Feel free to reach out to us at support@travelingvineyard.com with any additional questions! We’d love to hear from you. It’s wonderful to hear from you! You will always earn commission on the sales from your event. The $75 Tasting Set Credit will get you your next 5-bottle Tasting Set towards your next event! As long as you are holding qualified events ($150 in volume + 3 orders), you will not have to purchase wine out of pocket. Our average event is around $500, so our Wine Guides have no problem hitting that minimum. We currently have 12 active Wine Guides in the entire state of Idaho!! What a great time to join! Feel free to contact support@travelingvineyard.com or visit travelingvineyard.com to learn more. We also have a Taste of the Business webinar coming up: tiny.cc/tvtob if you want to listen in. Have a great day! I see that if I sell $150 in sales and have 3 orders at that same tasting, I will receive a $75 credit. Do I also earn commission on those sales? Also, does anyone know how many active guides there are in Idaho? It’s only available to residents of the United States. How is it possible to serve and sell wine without a liquor license? Is there some loophole because it’s being served and sold in people’s homes? Hi Jane! Great question! Traveling Vineyard hosts sign a Host Responsibility Letter before the tasting (which is a tasting of 1-2 ounce pours). Our Traveling Vineyard Wine Guides takes Host + Guests through a fun and educational wine tasting of 5 wines (the Host is required to pour for his/her guests). Hosts and Guests that are interested in placing a wine order may do so through our app or website – orders go directly to our licensed facility to accept and fulfill the order. The Wine Guide is not actually selling wine at the event, but acting as a marketing agent. We do have a few states (NH and NJ for example) that require our Wine Guides to obtain additional documentation based on specific state specifications. I hope this helps! If you have any additional questions – we’d love to chat more. Feel free to reach out directly to support@travelingvineyard.com. Cheers! Can I join if I live in Canada? Unfortunately, they are not open for business in Canada at this time. Given the nature of their business, they have to deal with strict regulations when it comes to alcohol. In fact, they are only open in 42 US states due to these regulations and laws. I’ll let you know if that changes in the future. Thanks for stopping by! I just don’t see how this can be worthwhile. If it cost you $37.50 just to have a party and your only making 15% that’s a lot of wine to sell just break even.? Not mention the extra $15 a month for the website. If I’m wrong please point it out in layman’ terms! Hi April, The average Traveling Vineyard show produces $400 – $500 in sales, which would earn you $80 – $100 in commission. With those sales amounts, you also receive a $75 tasting credit to purchase more wine. Let me know if you have further questions — happy to put you in touch with a Wine Guide. So you don’t pay for wine tasting wine you take to the wine tastings? The company pays for it, am I correct or wrong? What if you don’t make the 400-500 at one event? So you have to buy the wine for the wine tastings yourself? Very curious how this works. What if you have 3 parties lined up for one week? Are you able to get wine credit for the third set of wine? Hi Michelle! Included in our Success Kit are 10 bottles of wine (or two 5 bottle Tasting Sets) to get you started with your first two wine tasting events. The 5 bottle Tasting Sets are what our Wine Guides take with them to conduct a wine tasting. As long as our Wine Guides hold a “qualified event” ($150 in sales volume), Traveling Vineyard issues a $75 Tasting Set credit – the cost of another 5 bottle Tasting Set. So, as long Wine Guides hold qualified events (which our Wine Guides have no problem doing) – our Wine Guides never pay out of pocket for additional Tasting Sets! We’d love to help answer any additional questions you have! Please feel free to reach out to us at support@travelingvineyard.com or give us a call at 877-340-9869. Have a great day! Hi I just read this article! I am a one star leader with The Traveling Vineyard! Becoming part of The Traveling Vineyard has been such a awesome journey for and by far the best direct sales I have ever done! My business is consistent and I always have return customers! If you would like more information feel free to contact me! That’s great, Suzie! Appreciate you sharing your experience with the Traveling Vineyard. An excellent idea, definitely wine is not only to enjoy a good tasting, also is an opportunity to meet people and earn money.